If art history is the first methodological moment of monumental conservation, then the role of art historians in the construction of a conservation culture during the 20th century will be foundational. Understanding the validity of Dvořák’s thought from the account of his critical development is an opportunity offered by his translation. 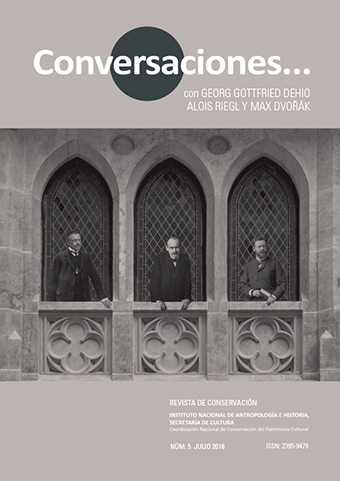 Not only as the resource to facilitate the philological knowledge of a specific source, but also by pondering his contributions from the German language, and generating concepts that become convictions and theories. Considering that as a contemporary of Riegl, of whom we do have pre-existing translations into Spanish, it places us beyond the dogmas that feed his partial dissemination in limited and sectorial invocations, that dissociate technical and specialized work from its social and community meaning. Based on this, our reading of the contribution of Dvořák focuses on two topics. The first in relation to the scale of the monumental heritage, considering an early approach of the environmental concerns derived from the heritage landscape as an integration of cultural and natural attributes. And the second refers to an ethical position in the work of the art historian, who contributes arguments anddevelops a collective conscience about the civic friendship towards monuments, understood as an expression of common good.